There truly are many types of guitar. 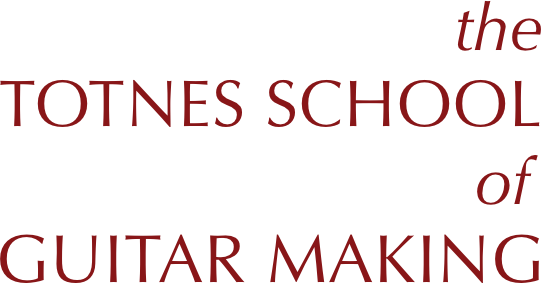 Also, there are many instruments related to the guitar which can be made at the School. 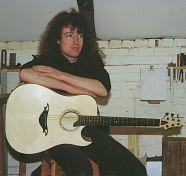 The majority of these guitars are modern, which is to say acoustic steel-string, classical or electric. Some of our students make close copies of well-known models. Many use a model as the basis of their own design. 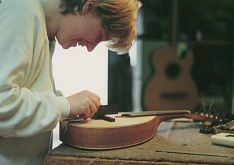 This can be achieved with unusual woods, for instance, alteration of the body-shape, or with custom inlay work. Other students are ever-inventive in combining the many possible variables. 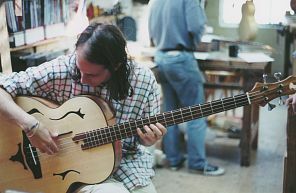 For example, an old Portuguese guitar was used as the basis of a modern, nylon strung 12 string; and an acoustic bass was built to function both normally and upright. The guitar has an inventive history. In fact, innovation, experiment and delight in variety should be seen as distinguishing features of its entire family. So that where pure-blooded "guitar" ends and "related to guitar" begins is hazy. Every culture and every time has guitars or guitar-like instruments. 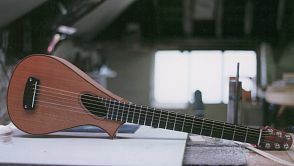 Personally, I think it is in the nature of guitar-makers to be inventive. And they have always had, as far as I can tell, a breed of players eager to try out new ideas. This long collaboration between makers and players has distilled the many possibilities and given us a mainstream. On occasion this happened quickly, as in Leo Fender's Strat, Tele and bass designs or the work of Les Paul. 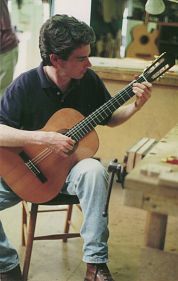 More often it has happened slowly: the essential features of a classical guitar or an acoustic have long since been established, but all guitarmakers will use their own shape, employ subtle variation in structure and continue the search. This search will almost certainly have many ends, because there are many kinds of music that use a guitar. Looking at instruments related to the guitar makes this clear. 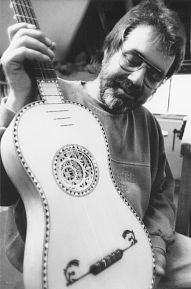 In the west, mandolin, mandola, cittern, bouzouki and banjo, to mention only a few, are as strong in their traditions as the guitar is in it's own. Further afield, the sitar, saz, quatro and a whole other host reflect their own cultures, and are equally well established. All this provides an immense source-book of ideas for students on the course. It might result in one person making a copy of, say, a baroque guitar or a lute. Or it might be that some decorative effect or interesting structure lends itself to re-invention, as part of a modern instrument.